Did you see the latest ALIEN film when it came out in theaters early this year? If not you get a chance to bring the film home! 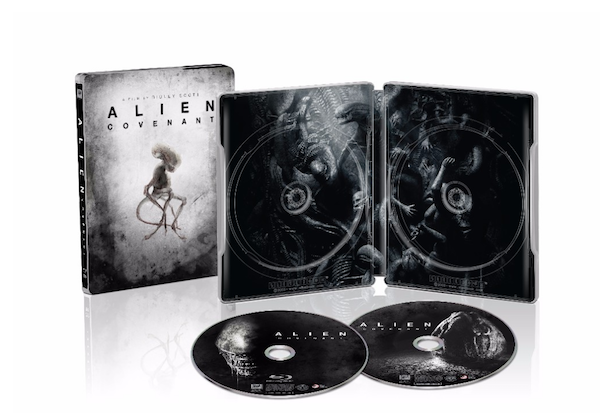 Twentieth Century Fox Home Entertainment presents Ridley Scott’s return to the universe he created, with ALIEN: COVENANT, the newest chapter in the groundbreaking ALIEN franchise, arriving on Digital HD August 1 and on 4K Ultra HD™, Blu-ray™ and DVD August 15. Limited Edition Exclusives will be available at Walmart, Target, and Best Buy. Featuring an all-star cast including Academy Award Nominee Michael Fassbender (X-Menfranchise, Steve Jobs), Katherine Waterston (Fantastic Beasts and Where to Find Them), Billy Crudup (Jackie), Danny McBride (This Is The End) and Demián Bichir (The Hateful Eight), ALIEN: COVENANT is loaded with bonus material including a making-of documentary, deleted and extended scenes, commentary by director Ridley Scott, an inside look at “David’s Lab,” crew fear tests, and much more. Print article This entry was posted by Art Eddy III on July 6, 2017 at 1:16 pm, and is filed under Entertainment. Follow any responses to this post through RSS 2.0. Both comments and pings are currently closed.